Ornithomimids were a distinctive group of theropod dinosaurs who show a good example of convergent evolution with the ratite birds, such as ostriches. They were not as closely related to birds as the Dromaeosauridae were, but were still members of the well supported group Coelurosauria, which includes birds. Ornithomimids are interesting and useful for the information that they can give us about the origin of birds. Ornithomimids were generally slender, lightly-framed, and (unlike ostriches) reached huge sizes (some attaining lengths of 20 or more feet; a pair of ornithomimid-like arms was found in Mongolia that are 8 feet long!). They were not a very diverse group, either in terms of the number of species that evolved or the difference in the morphology between species. Basic characteristics include: long, slim hindlimbs, elongated forelimbs with uniquely structured hands (their thumbs were apparently not as good for grasping as those of the Maniraptora were), and a flexible neck ending in a small beaked head. The structure of the manus (hand) is the main feature used to distinguish between species of ornithomimids. Examples of ornithomimids include Gallimimus bullatus of Jurassic Park fame, Struthiomimus altus (shown above left), and Ornithomimus velox, one of the dinosaurs discovered in the 1800s rush for fossils. All were limited to the late Jurassic and early to late Cretaceous periods of the Northern Hemisphere; remains are uncommon probably due to their fragile bones and low diversity, but are known from North America and Mongolia among other localities. 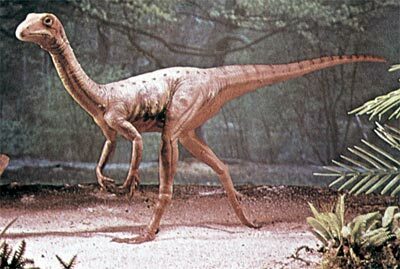 Some scientists suggest that ornithomimids were fast runners (cursorial); perhaps the fastest of all dinosaurs judging from their long hindlimbs. This may be, but how much faster is a difficult matter to ascertain. Long legs are useful for runners, but are not the only variable that determines running velocity. How often an animal swings its limbs (stride frequency) is also important, and cannot be determined directly from fossils. Other variables further confuse the issue; how much faster does an extra 5% leg length make you than a shorter legged relative? In any case, the analogy between ostriches and ornithomimids is a weak one, and it is not safe to assume that they ran similarly, or behaved similarly, just because of some superficial physical similarities. Analogies and other metaphors only get you so far. Reality can differ a lot among analogs. The ornithomimids' beaked jaws were probably weak; it is thought that they may have been omnivorous, eating small animals and maybe some plant material. There is still little concrete evidence what they ate. The ornithomimid brain cavity was fairly large for a dinosaur, and quite similar to that of birds  ornithomimids may have been more "intelligent" (whatever that word really means) than most other dinosaurs. Nonetheless they did not survive the extinction at the end of the Cretaceous period, and were apparently among the last groups of non-avian dinosaurs to go extinct.